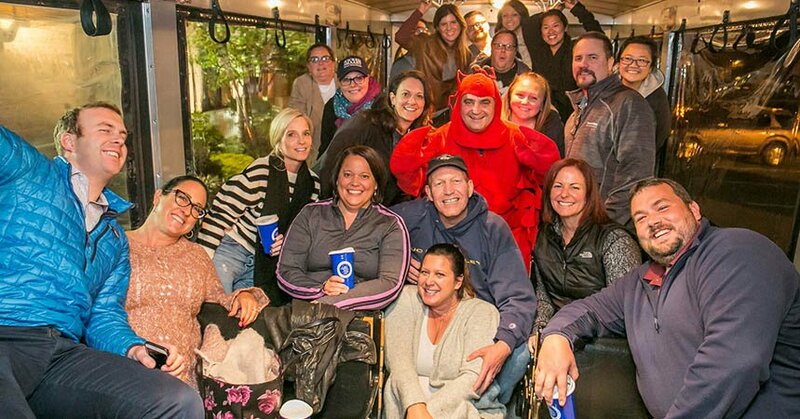 We offer trolley tours throughout Boston’s historic mobster underworld for any Corporate Events and Outings in Boston, our tours are followed by a traditional New England lobster dinner. 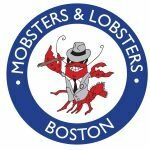 Mobsters and Lobsters is a one-of-a-kind trolley tour that takes you inside Boston’s storied, shadowy, sinister underbelly. The tour includes sites of historic heists, mobster hideaways and hangouts, and ‘old neighborhood’ locales shrouded in intrigue and mystery. Guests will hear tales of thievery and scams, mayhem and cover-ups, and untimely demises. The tour concludes with a famous lobster dinner at one of Boston’s finest waterfront restaurants. (There are alternate menu options for those who wish.) 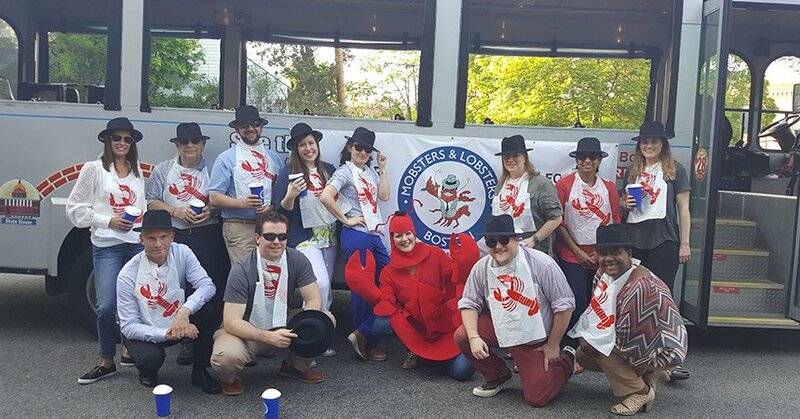 Make Mobsters and Lobsters your choice for your Corporate Team Building activity or Company Outing! I don’t even know where to begin! To start Victoria and her husband Thomas are the nicest people ever! From the moment you walk on the trolley getting greeted by the lobster the fun begins . The tour itself is so fun and interesting. Listening to the mob history and driving in the city gave me chills! When the tour was over we went out for a delicious lobster dinner. I highly recommend taking the tour with a group of friends. I can’t wait to go back again! We took this tour as part of our company outing last week with a group of about 30 of us. Tom was amazing and witty and full of incredible facts about the city. The dinner was delicious and a gorgeous view. I highly recommend this company. Tour operates all year with charters available upon request. 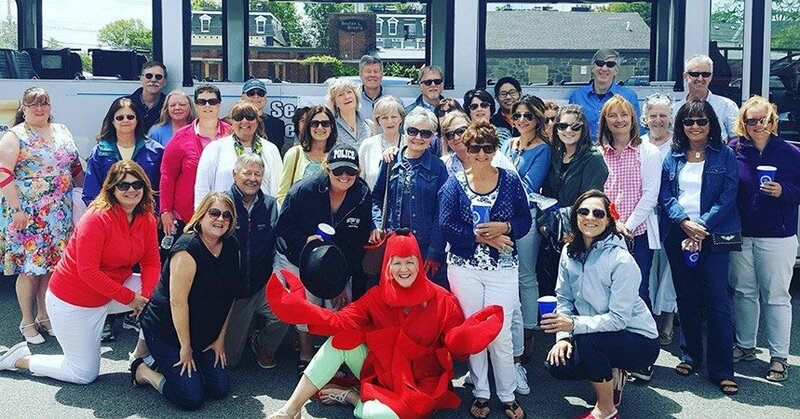 Where: Trolley departs from the Waterfront at the New England Aquarium or your group can be picked up and dropped off at a location within the Boston area. Tour of sights from Boston’s underworld history across the city. Why: Boston loves its criminal lore almost as much as it loves its sports teams and politics. The city’s unique intermingling of mobsters, law enforcement and politicians shows how criminal empires were built and how they crumbled. Info: Tickets cost $99/per person* for our tour and lobster dinner. For the tour only it is $50/per person. For reservations and more information call: 781-964-2472 – Only 40 seats available per trolley! Prices are subject to change due to the market price of lobster. Minimum booking requirement of 20 guests per group, however prices can be adjusted to accommodate those with less. Click button to load the boss’s number directly to your phone. Be a member of our family. And get informed by joining today!